Groups that rescue donkeys in Iowa and Nebraska are working together to find homes for several animals. Stephanie Shehan is one of the directors at Lusco Farms Donkey Rescue in Malvern, Iowa. That organization recently teamed up with Epona Rescue near Crete, Nebraska, to save the creatures. Shehan says a Nebraska woman called after her father died and she didn’t know what to do with a donkey. 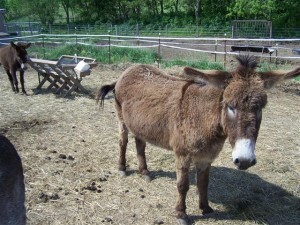 Lusco Farms rescued two donkeys, while coordinating with Epona to find homes for a mule, a pony and her colt. Shehan says the animals were in good health and had received great care, in fact, they’d been spoiled a bit too much. “Only one has hoof issues and other than that, they’re just a little, well not a little overweight, they’re quite overweight,” she says. “The gentleman was feeding them Twinkies.” They’re on diets now, thanks to a vet’s advice. She says it’s fortunate for the animals the groups were able to work together, if nothing more than to save money on feed. Hay prices due to drought have skyrocketed. Shehan says more people are contacting Lusco Farms Rescue and to surrender their donkeys, mules and horses because they can no longer afford to feed them.